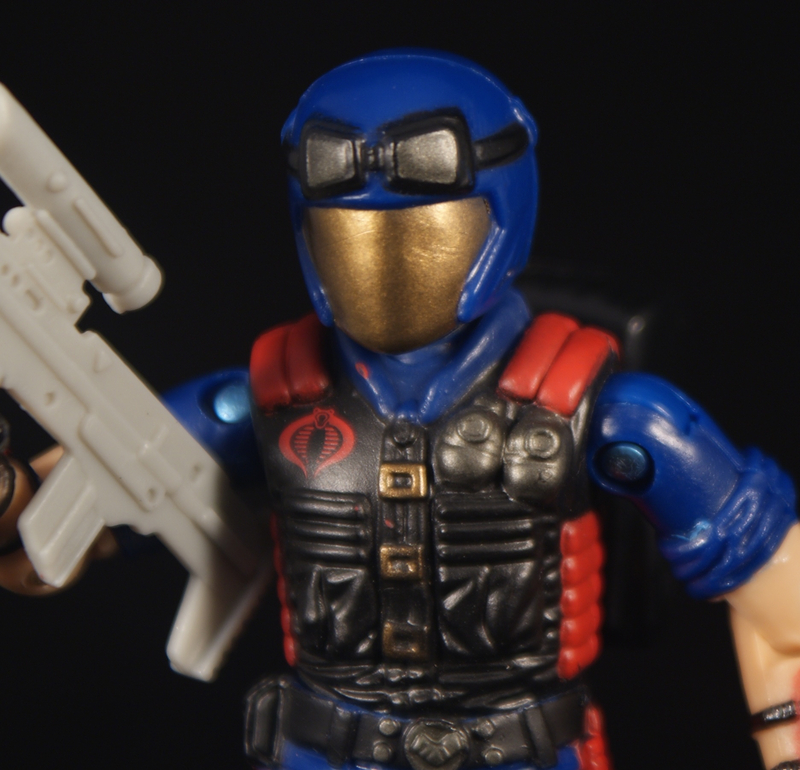 I was stoked when I first found out about the DTC Cobra Viper Pit set. Here was an army builder pack of Vipers that not only gave us something close to the old color scheme, but also looked to have solved the problem of the funky leg molds that plagued the previous re-release versions. Well, sort of. While the thighs returned, the lower legs were apparently still MIA, or not in the budget to recreate. It’s a shame, since the rest of the figures are well done. Okay, so the BAT waist is still there too, but you get the idea. After getting lost in a sea of muddy and odd repainted Vipers, it’s nice to get a bold blue one again. Even the weapons choice isn’t as random as the new sculpt era toys often presented. The machine gun with cartridge was a pretty wonderful weapon, if a bit of overkill for the Cobra ground pounders. Smaller SMGs were also included, along with the Ambush rifle, and underrated accessory in my opinion. And hey, it’s done up in grey. Another unique painted feature is the gold faceplate. While this detail isn’t referenced on the file card, I assume it’s meant to call out the figure as a squad leader. Never liked the 86 viper design. Goggles AND a full face plate visor??? That’s like wearing mittens over gloves. I’ll grant that there was demand for Vipers who were, basically, reissues of the vintage figure. But, why, oh why couldn’t Hasbro have tossed in a a couple of differently colored staples like an Arctic Viper, Desert Viper and even one in all black. One of those, plus the gold face plate and 2 silver versions would have been a much better set. The first wave of these sets sold through and they started to appreciate. But, Hasbro released a second production run that was WAYYYY more than the market wanted and these things were available for retail for quite a while. The accessories were a breath of fresh air, though, as the six packs had gotten really terrible. I picked up this set back in 2007 and I still have them on display. My only complain, at least with my own set, would be that the holes in their backs are a little too big for the included backpacks. Also, the grey rifles are too thin for my taste. And I’ll have to agree with Forgotten Figures that it would’ve been cool with a couple more variations. 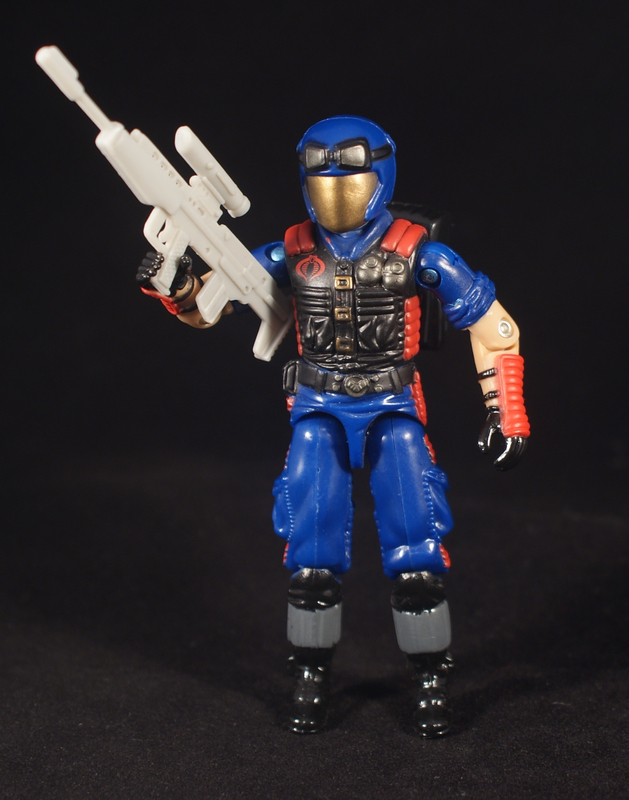 Personally, I think Hasbro should re-issue a lot of the vintage era Joes. I’d like to see sets of Techno Vipers, Snow Serpents, Toxo Vipers and Iron Grenadiers. All done the original style with a squad leader in each pack. Darn shame that we never got those classic boots. Kinda ruined all of the other Viper figs for me. The Viper Pit was my intro to army-builders, and I’ve since acquired two more sets. I only wish Hasbro didn’t use the original’s waist and legs on the ’93 Mindbender–would have saved us all a couple decades’ worth of headaches. Double edged downside to the new thighs: the legs tend to break the waist and the Vipers don’t have backup sidearms. I got so used to seeing the BAT legs on Vipers that I kinda prefer them to poofy cargo pants. Still, these figures are great to bulk up a scene, and I do like the black gloves versus the original ’86s red ones.